It was a working holiday for Indiana land improvement contractors when they attended the LAND CARE EXPOSITION on the Jeff and Trisha Stevens farm near Waldron, Indiana. For three days they ogled the new earthmoving machines, waiting their turns to climb on board and move dirt. And there were of plenty machines to watch and try out. Sixty-six members of the Indiana Chapter of the Land Improvement Contractors of America (LICA) and 33 associate members had furnished 35 different pieces of equipment valued at $10 million. All day long, the operators dug, piled and smoothed dirt, reshaping the farm and constructing needed soil and water conservation measures. When Jeff and Trisha bought the farm the year before, they realized that there were soil and water problems that needed fixing. They developed a conservation plan to correct the problems with technical help from the Natural Resource Conservation Service (NRCS). During the Exposition, or field day (as most folks called it), 10 different conservation practices were constructed at 10 locations on the 139-acre farm. These practices included: a farm pond; water diversion; grass waterways; erosion control structures; rock chute; an open drain; surface and tile drainage; a hog manure disposal system; and a new septic system for the farm house. Heavy equipment is essential to construct these different conservation practices, whether at a field day, or on the countless farms across the nation. "We couldn't do all this conservation work if we didn't have these kinds of machines," one visitor, well up in years, remarked to me as we watched the pond being built. "Do you remember when the only way we could move dirt was with a shovel or with a slip scraper pulled by horses?" he asked me, obviously wondering if I, too, could remember that far back. Then, before I could answer, he volunteered, "I remember the first bulldozer that came into our part of the country. I guess it must have been along about the early '30's. Why, you could move more dirt in an hour with that dozer than a team and a scraper could move in days. Maybe weeks." I had to agree wholeheartedly when he added, "The whole soil conservation revolution in this country just plain took off when the bulldozer came along. Look how much (soil and water) conservation has been done by farmers and contractors since then. We've come a long way." We stood on the hillside, watching the pond taking shape. An operator skillfully guided an excavator digging a core trench, later to be re-filled. Once completed and packed tightly by a self-propelled vibratory compactor, the base was ready for the dam proper. A dozer sliced off a layer of dirt on the side slope and moved it down to the dam site, while a scraper also carried dirt to the site. All the while the compactor moved back and forth across the rising fill. 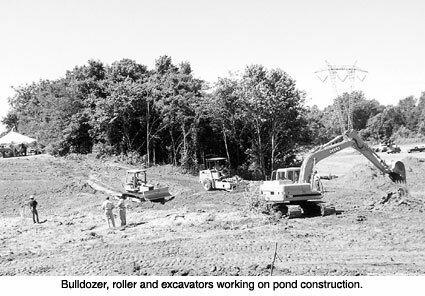 Little by little, the dam rose until, at the end of the field day, the pond was completed, thanks to the maneuvering of the dozer, the excavator, the scraper and the compactor by the skilled operators. These were the contractors who had come to look, learn and try running these earthmoving marvels. Leaving the pond site, we walked down slope into a soggy and wet flat bottomland. Here a chain trencher, a wheel trencher and a plow, all self-propelled, were laying plastic drain tubing. I couldn't help thinking about how the laying of a tile line had changed over the years. What a change from the past days when subsurface water was sometimes drained off through a rock-lined underground channel or through wooden, or baked clay or concrete tile. And the trenches were dug by hand using a 'tiling spade'. I remembered my Dad laboriously digging a tile trench on our farm, one spade-full at a time. Today, modern trenchers move continuously, cutting trenches up to 10 feet deep and 2 feet wide, laying thousands of feet of tubing a day. Lasers guide the trenchers and regulate the depth of cut. There was a demonstration where a tiling machine was operated and the grade fully controlled by the use of GPS (global positioning surveying). No laser was needed. Watching the GPS and the lasers in operation, my memory flashed back again to my youth when the 'tiler' poured a bucket of water in the trench to check the grade. If the water didn't flow, the 'tiler' dug deeper until the water did move. Leaving the trenchers, we stopped at another site where we watched, along with contractors and other visitors, two demonstrations on solving an increasingly difficult problem contractors face in getting rid of trees, stumps, and other woody wastes. 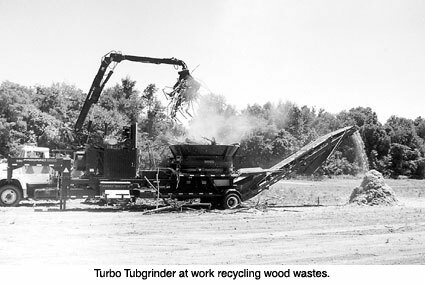 Since burning is no longer allowed in most areas, two different easily movable wood recycling machines, Toro's Tubgrinder and Rexworks Biogrind, were demonstrating their equipment. The machines ground the wood into small size pieces usable as mulch, compost or animal bedding. There were other demonstrations also, geared towards disposal of bathroom wastes, stormwater management and erosion control around the family home. Infiltrator Systems installed an Infiltrator Sidewinder chamber to handle the septic system. The high density PolyTuff polyethylene molded chamber system requires half as much space and is installed in half the time of conventional systems. Other businesses spread their messages to the field day visitors. For example, Dawn Holtmeyer, Koch Pipeline Company and Dave Rossi, Texas Eastern Pipeline Co. served up safety messages for people living near pipelines. "We welcome this kind of gathering to alert contractors and landowners about the pipelines and how to operate around them," said Dawn. Dave added, "We like working with groups like LICA. I wish we could meet with more groups like this to help get the safety message out to contractors. Safety concerns us all." The Indiana field day idea was the brain child of the INLICA chapter. "We wanted to show the public how LICA members fit into the whole field of soil and water conservation," said Don R. Sesson, then Executive Director, but now retired. "We also wanted to demonstrate how various conservation problems, both on and off farms, can be solved. Best of all, we wanted equipment companies to demonstrate their newest machinery and for contractors to be able to operate them under field conditions." These goals of the IN LICA were largely fulfilled, according to members. There were an estimated 10,000 visitors, 80 exhibitors and 25 different demonstrations, including such varied items as GPS surveying and mapping, trenching and excavating safety, well drilling and a portable sawmill. Major sponsors, besides the Stevens' and INLICA, included the Shelby County Soil and Water Conservation District, Purdue University Cooperative Extension Service, USDA-NRCS, the Farm Service Agency and the IN Department of Natural Resources. Many other organizations and individuals helped with the field day. "There really was something for everyone: contractors, equipment dealers and the general public," explains Stephen Wilson, field day Chairman, and a land improvement contractor, specializing in drainage. "We wanted contractors to see and have hands-on experience with the newer earthmoving equipment. We wanted equipment dealers to be able to showcase their equipment, especially to interested contractors. And we wanted the general public to get a better understanding of the work of our LICA members." Stephen tells of several contractors from other states who came to the field day, primarily to have hands-on experience with the newer equipment. One man, particularly, was so impressed that he operated one of the newer dozers for fully a half-day. "Dealers were well pleased because they were able to get wider exposure for their equipment and especially because a higher percentage of the visitors at the field day were contractors, and thus potential customers, more so than when equipment is shown at fairs or shows," explains Stephen. Trisha and Jeff, resident hosts for the field day, were more than pleased at the reaction of visitors who came to their farm. "Many said they were pleasantly surprised at the smooth way in which the event operated and the reception they received," says Trisha. "Even though we had such a good turnout, we could have handled more if they had come."